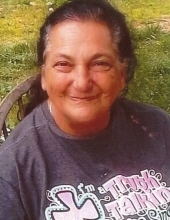 Williford- Sharon Kay Wheaton, 62, passed away Monday, April 15, 2019 at Flo and Phil Jones Hospice House. She was born September 6, 1956 in Lepanto to the late James Veach and Thelma Blake Veach Mangrum. She will be remembered as a loving mother, sister and grandmother. She was survived by her children, James Wheaton (Amanda), Lisa Thompson (Bobby), Timothy Wheaton and Ricky Wheaton all of Williford; two brothers, Tommy Veach of Caraway and James Veach of Rose Haven, MD; five grandchildren, Riley Wheaton, Tyler Wheaton, Lilyan Wheaton, Traci Wheaton and Austin Thompson. She was also preceded in death by her dad, Wilford Mangrum and a brother, Ricky Veach. A celebration of her life will be 2:00 pm, Wednesday, April 17, 2019 at Gregg Funeral Home Chapel in Monette. Interment will follow at Caraway Cemetery. The family will receive friends from noon until time of service at the funeral home. To send flowers or a remembrance gift to the family of Sharon Kay Wheaton -GFH, please visit our Tribute Store. "Email Address" would like to share the life celebration of Sharon Kay Wheaton -GFH. Click on the "link" to go to share a favorite memory or leave a condolence message for the family.